You can do a migration to a paravirtualized VM on Xen-on-SLES (version 10 only). This is done indirectly, through a two-stage process. The paravirtualized VM needs to be transformed into a fully virtualized VM first and later transformed back. A utility (xmps), included in your PlateSpin boot ISO image, is used to transform the VM. The procedure varies slightly, depending on whether the target is a new or an existing paravirtualized VM. Copy the PlateSpin boot ISO image to the target Xen/SLES server. Select the I need to install an operating system option. Choose a suitable size for the disk image (the disk size should be equal to or bigger than that of the source machine). Select the boot ISO as the installation source. 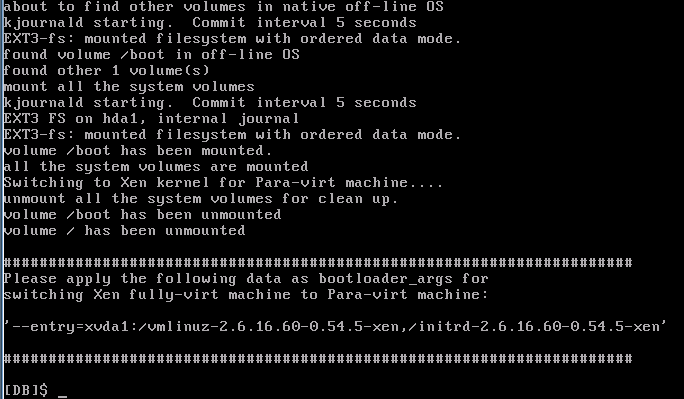 The VM boots into the PlateSpin OS environment, used in X2P settings. See Migrating a Workload to Xen Hypervisor on SLES. Upon completion, the VM should be fully functional as a fully virtualized machine. Reboot the VM, making sure that it still boots into the PlateSpin OS environment. At the boot: prompt, type switch and press Enter. These are used by the xmps utility to set up the location of the kernel and the initrd image, from which the paravirtualized machine boots from. # /mnt/ps/tools/xmps --pv --vm_name=SLES10-FV --new_vm_name=SLES10-PV --bootloader_args="--entry=xvda1:/vmlinuz-2.6.16.60-0.54.5-xen, /initrd-2.6.16.60-0.54.5-xen"
NOTE:If a VM with the same name as the one passed as new_vm_name already exists, the xmps utility fails. The newly created paravirtualized VM (SLES10-PV) should now be available in the Virtual Machine Manager, ready to be turned on. The corresponding fully virtualized machine is retired and will fail to boot. This VM can be deleted safely (only the VM configuration will be removed). The newly created fully virtualized machine (SLES10-FV) should now be available in the Virtual Machine Manager. Turn on the newly created fully virtualized machine (SLES10-FV). Reboot the VM, run switch, and reconfigure the workload as described in Linux Migration to a New Paravirtualized VM (from Step 4 to Step 9 only).